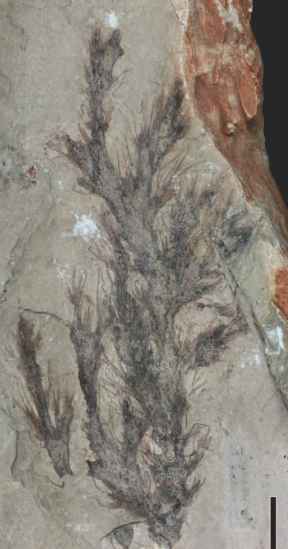 PaLeoBOtany: the bioLogy and evomnon of fossiL pLants cones or strobili. Many types are known and they are preserved in various ways. Historically, the morphogenus Sphenophyllostachys was used for all Sphenophyllum cones, but Hoskins and Cross (1943) argued that Bowmanites has priority and should be used instead. Several other genera of sphenophyllalean cones have later been introduced in recognition of the wide diversity displayed by these structures (see Good, 1978). 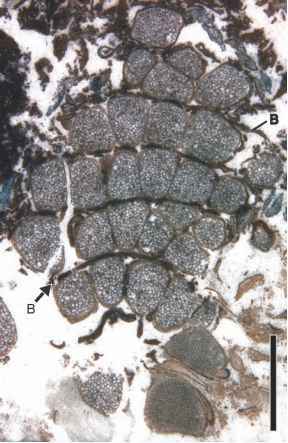 figure 10.17 Paradermal section of Bowmanites dawsonii cone showing whorls of sporangia containing spores and bracts (B) between (Pennsylvanian). Bar = 3 mm. cone axis and fused laterally to form a shallow disk. Toward the margin of the disk, individual bracts are separated and upturned at their tips to overlap the bracts of several whorls above. In B. dawsonii, each bract subtends two sporangi-ophores of unequal length that arise from the adaxial surface of the bract close to the cone axis (T. Taylor, 1969). At the distal end, each sporangiophore is reflexed and bears a single large sporangium at the end. Sporangia are thick walled and ~2mm in diameter; trilete spores range from 96 to 180 pm in diameter. Covering the surface of the spores is an extraex-inous membrane that has been interpreted as homologous to the perispore of certain homosporous ferns (T. Taylor, 1970a; W. Taylor, 1986). Bowmanites moorei is a relatively small cone with a maximum diameter of ~4mm (Mamay, 1959b). Three bracts are produced at each node and laterally fuse to form a disk. Each bract consists of a median fertile lobe flanked by two sterile lobes. Bract tips do not overlap the whorl above. Each fertile lobe produces two recurved sporangia. In B. fertilis (Scott, 1906a) from the Lower Coal Measures of Belgium, each node produces six adaxially oriented stalks, which branch at the tips to form 14-18 sporangiophores. Each sporangi-ophore bears two recurved sporangia. Further morphologic variability is present in B. trisporangiatus, a cone 6 cm long (Hoskins and Cross, 1943). A whorl consists of 18 bracts that produce three sporangiophores each; spores are large (100-150 pm) and trilete. Despite considerable variability in the size of some spores, which may, in part, reflect measurements that include the perispore, all species of Bowmanites were monosporang-iate and the genus is regarded as homosporous. Reports of heterosporous Bowmanites-type cones (Arnold, 1944) have later been discounted or the affinities of the cones reinterpreted. It is interesting that not all species of Bowmanites had trilete spores. Some, like B. bifurcatus, contained sporangia with monolete spores (Andrews and Mamay, 1951). In this species the cone is small (1.5 cm long and 3 mm in diameter). Each whorl of bracts contains six bracts; a single sporangiophore arises from the adaxial surface of each bract and bears two sporangia.